How much you want or need to organize is a personal preference and this is fine, however, if you are looking for more ways to become more organized it is not difficult becoming overwhelmed with the amount of advice and tips that circulate the internet. Knowing which tips about organizing are the most important ones to follow as well as understanding your ability to make those organizing tips your own, giving them you own variations to a wide skill is important to make them work well for you. Organizing is a very wide subject and there are the extremes as in many areas, you are highly organized to the point where it becomes an obsession, but you don’t have to have the cleanest of homes. These are different areas entirely and yet they are often mistaken as being part of a package a misconception that many people believe. It is the same in reverse, you don’t need organization skills to have a clean home, you can have them separately and that is something that is often misunderstood. Therefore, I feel that tips about organizing aren’t directly related to cleaning! I feel that no matter how organized other people see me, I feel as though my life sometimes is a total chaotic mess. It is the same with my cleaning if I haven’t done any I feel that my home will feature in the next hoarding alive episode. Yet other people still think my house is spotless! It is about you as a person and the skills you can learn to enhance areas of your life. These tips about organizing are great, but remember to make them your own, tweak them to make them fit your needs, if they don’t work try a different approach to the same problem! The most important skill to learn is planning, you have to learn to write things down and follow those plans. It doesn’t matter if it is on paper or electronic, what does matter is you get into the habit of using this planner on a daily basis and following the directions. It will help you keep appointments and allow for future planning. I am in love with the disc bound systems, they allow me the flexibility to create schedules and plans that work for me. Another area that is important is deadlines, you need to know in advance when things need completing by. Without deadlines, you have no structure to your plans and you can easily put off given tasks by moving the deadlines and not following through with your actions. Everything you own must have a home, a place where it belongs. I am not saying that you should never move something, but having a place to put an item when you have finished with it means you will know where to find it the next time you need it. If you have limited storage then it is important that you regularly declutter your possessions so you don’t end up with more than you need. Mail and paperwork can build up without much thought; it is as though it grows overnight, developing into this demon called the bill pile. The truth is if you deal with the mail the day it arrives then you won’t have paperwork that starts to take on a life of its own. A to-do list is important, however, you do need caution; it is a powerful tool that can destroy you. 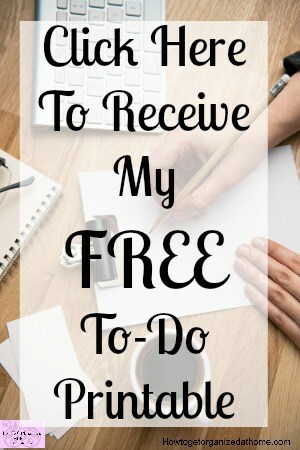 Becoming obsessed with to-do lists and creating these mammoth lists that no one could ever complete in a single day, can overwhelm you to a point where you tackle nothing; however, a well-crafted to do list is a fantastic tool that you can use to focus your mind and help you achieve your dreams. One area that is a definite no is buying or creating more storage, that means you have more things than you want or need and the best course of action is to get rid of some of the things you already own. Make room for the items you have and not invest in more storage that will mean more clutter in your home. 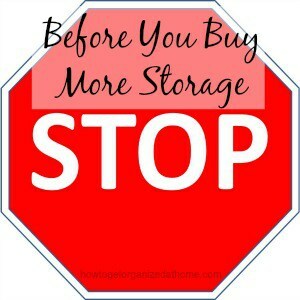 For more information on this area check out my article Before You Buy More Storage. It is very difficult to let go of some things, but ultimately the thoughts and memories that you have in the possessions in your home are just objects, the memories are those thoughts and images that you have locked up in your brain. Procrastination is such a demon, it can prevent you from following your dreams and desires; it can mess up perfectly reasonable plans and is so unforgiving in its desire to destroy any good intentions that you might have. Check shelving, sometimes the simple repositioning of a shelf can and will have a positive impact on the items you can fit onto a shelf. This is important in a kitchen or pantry when often the items you want to store are part of a more economical way of shopping. Being organized doesn’t mean your home is spotlessly clean, you still need to follow some sort of cleaning schedule. Being organized and having a clean home are two separate areas, often brought together under the misconception that with one the other will follow. This is not the case and you have to work on both areas to have an organized life and a clean home. There are ways that you can get help with organization; there are many books full of tips about organization techniques and ways to implement more of these into your life. 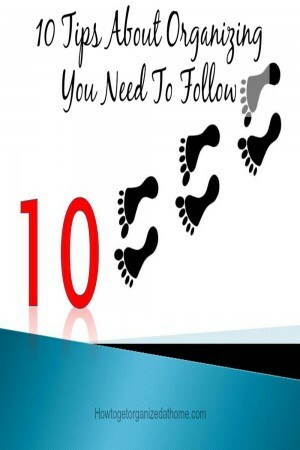 While often the advice is great, just reading about these tips doesn’t put them into action. You must take action to move forward with your skills. Alternatively, you can opt for the professional organizer; they can help you actually put the theory into practice and to start helping you to find new ways to organize your life. You have to develop the ideas to fit your needs, don’t be afraid to change something if you feel it is no longer working and meeting your needs. For anything to improve your life think of easy tasks that are manageable in your life; if it doesn’t work, swap it for something that does work. Therefore, it is important that you understand the tips about organizing mentioned above are there to help you find and develop your own organizational skills, they are not the same as the next person and that is OK because you are not the same people. We all have different personalities and different ways of doing things and that is fine, it is about finding your own way of addressing your organizing skills and adapting them to meet your needs. If you are looking for more articles on this topic head over to the landing page where you will find links to other articles on organizing. The thing about to do lists is that they are for things to be done in the future. I have to be careful not to just write something down to avoid doing it! If it’s quick, I need to do it. If I need to wait to do it, then I put it on my list. I fully agree with having a planner!